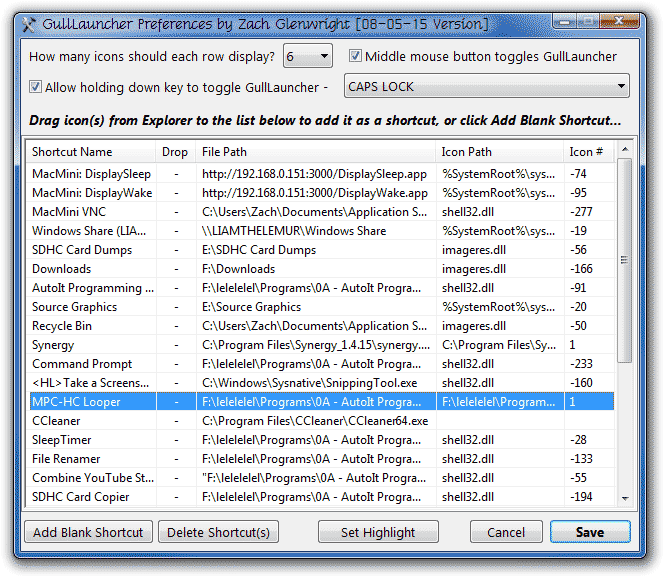 GullLauncher is a set of programs I wrote for easy program access right at the mouse pointer. Years ago, I used a demo of Maya, the 3D composition program, and I absolutely loved one of the features in the program - if you held down the space bar, a complete set of menus would show up, directly where the mouse pointer was. 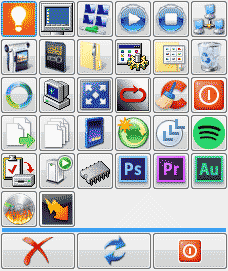 GullLauncher was written to give similar functionality, but for launching programs and shortcuts globally throughout Windows - click on the middle mouse button*, and a highly-customizable little panel shows up, right where the mouse pointer is, with links to files, URLs, folders, program shortcuts, and (if you want them to), drag-and-droppable program launching. 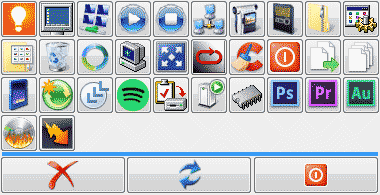 * - Now, if you don't want to use the middle mouse button to launch GullLauncher, you can turn that off... you can also use a keyboard shortcut, like holding CAPS LOCK or SCROLL LOCK down, to launch it... or if you don't want to do either of those, it can be launched from the taskbar! 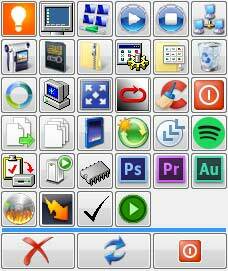 The GullLauncher package consists of 2 programs - the GullLauncher panel itself, which is a small utility that runs in the background, and a Preferences program that lets you set up the button shortcuts, how to toggle the panel, and how many shortcut icons show per row. - My program has been tested to work in bunch of different situations, but it might not work in every single configuration - I'm not responsible for loss of data from the use of GullLauncher (which should not happen, but... I'm putting it out there just in case.) My test system is Windows 7 64-bit. Although the executable is compiled as a 32-bit executable - it should work fine on both 32-bit and 64-bit systems. - My program is written in AutoIt - AutoIt programs are flagged by many virus scanners as being malicious - there isn't anything malicious in my program or it's code, and it doesn't have any kind of adware, malware, spyware, etc., as part of any of it. The only external piece of code in my program that I did not write is the code that allows moving shortcuts around in the Preferences program. The Preferences Program is the program that you use to do all of the management for GullLauncher. 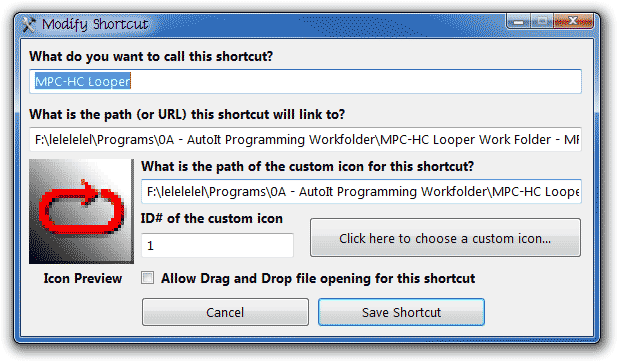 With it, you can add and delete shortcuts to files, folders, URLs, and programs to launch, as well as set up how many buttons you want to show per row, whether or not you want the middle mouse button to toggle the GullLauncher panel or not, and/or if you want to use a keyboard shortcut to toggle the panel, in addition to (or instead) of the middle mouse button. You can also use an icon picker to choose your custom icon, if you choose to... this will auto-fill the custom icon path and custom icon ID# fields. Once you're done making changes to your current shortcut, click on the Save Shortcut button to save the shortcut to the main shortcut list, or click Cancel if you don't want to add it. To modify an already existing shortcut, just double-click it - a similar dialog will open, allowing you to change the details of that specific shortcut. Selecting a shortcut in the shortcut list and then clicking on the Set Highlight button will add the phrase "<HL>" to the currently selected shortcut. When you launch the GullLauncher panel, the icon that is set as the highlight icon will hover directly over the mouse pointer, allowing for very quick access to a specific program/link in your shortcut list. If you decide you want to set a new highlight, just select a new shortcut you want to change the highlight to, and click the Set Highlight button - it will remove it from the current highlight you have set and move it to the shortcut you currently have selected. If you don't have a shortcut set as the highlight, the GullLauncher panel will center itself over the mouse pointer when you show it. When you're done setting up all of your preferences, and you have a good list of shortcuts going, you need to save the list in order for it to show up in GullLauncher. To do this, click on the Save button. This will change the current ButtonsList.prefs file to reflect your new changes, and it will back up the original ButtonsList.prefs file to ButtonsList.prefs.bup - this way, you can revert back to the old shortcuts/settings if you need to. To close the splash screen, wait for a few seconds, and then click anywhere on the screen. The splash screen will disappear, and now GullLauncher is ready to go! The GullLauncher taskbar icon also allows you to adjust your toggling options on the fly, so for example, if you decide later on that you want to change back to allowing middle mouse button toggling, you can enable it easily. If you re-load the GullLauncher settings by clicking on the re-load button (shown below), it will restore the toggling settings to their Prefs program defaults that you originally set up. 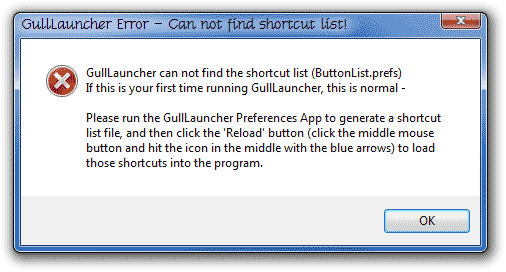 If you launched GullLauncher.exe for the first time before running the preferences program, you'll see an error - this is perfectly normal, it's just showing that you don't have the preferences file set up yet. Once you run the preferences program and save a shortcut list, it makes a ButtonsList.prefs file in the folder you've extracted GullLauncher.exe and the Preferences program into. Refreshing GullLauncher to reflect the changes once you've made the prefs file is easy, just toggle the GullLauncher panel and click on the blue re-load button on the bottom, in the middle, to refresh your changes.